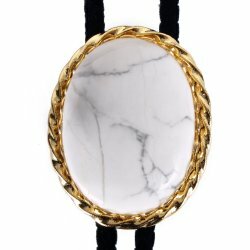 The Howlite Twisted Edge Bolo Tie features a large Howlite stone measuring 40x30mm (or 1 5/8" by 1 1/4") and weighing approximately 80 carats. 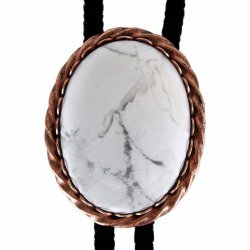 Howlite stones are often referred to as "White Buffalo". They feature an ivory or white background with a spiderweb pattern of black lines. 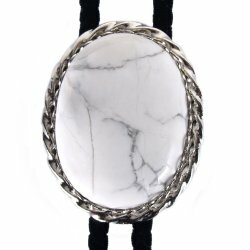 The stone sits in a oval slide with an attractive twisted edge. It measures 1 3/4" long by 1 1/2" wide and comes in your choice of gold, silver or copper. Add your choice of cord and tips to complete your tie.